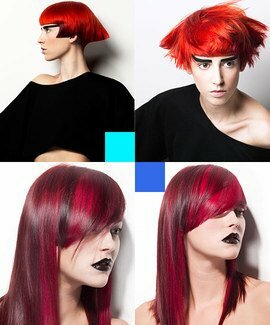 Learn how to cut and colour hair with some of the best hairstylists working in hairdressing today. Each of the MHDPro hairdressing courses is designed to allow you to learn at your own pace and in your own time. The MHDPro online hair cutting and colouring courses consist of five video tutorials and supporting PDFs and provide in-depth step-by-step instruction on cutting women’s hair, then using colour to enhance the shape of the hairstyle and the client’s personal style and colouring. Whether you are an all-round hairdresser or work as part of a team, understanding how the two disciplines work together will increase your ability to give your clients the ultimate experience. Each tutorial builds on the skills learned in the previous one to help you develop your hair cutting and colouring skills and techniques until you fully master and understand the concepts and techniques required to achieve up to the minute hair trends. MHDPro will continue to add more courses on a regular basis to provide a comprehensive library of the latest hairstyles and trends that will inspire you and ensure your clients keep coming back. On completion of each course, you can download, print and share a CPD Certificate of Recognition endorsed by VTCT & iTEC.